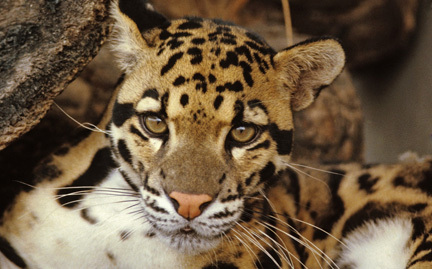 The clouded leopard inhabits the tropical forests of Borneo, India, Indochina, Malaysia, Sumatra and Taiwan. Clouded leopards spend most of their time in trees, where they move with great agility. Their large upper teeth are bigger than any other cat species’. These striking cats are at risk from over-hunting and habitat loss.